↑ Blum, Ron (April 10, 2009). 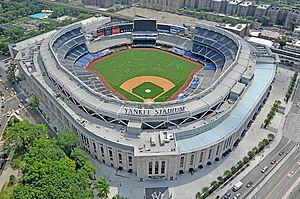 "New $1.5 Billion Yankee Stadium Formally Opens". Yahoo! Sports. Associated Press. अभिगमन तिथि April 16, 2009. ↑ Marchand, Andrew; Matthews, Wallace (March 25, 2014). "Question 4: Will Jeter Lure 4 Million Fans?". ESPN. अभिगमन तिथि March 26, 2014.